12th May, 2011 – Nintendo, a worldwide pioneer in the creation of interactive entertainment and Capcom®, a leading worldwide developer and publisher of video games today confirmed that they have entered into a distribution agreement for the forthcoming game Resident Evil: The Mercenaries 3D to be made available on Nintendo 3DS. Under the terms of the agreement Nintendo will be responsible for the sales, marketing and distribution of the game throughout European territories, with Capcom remaining as publisher. Resident Evil: The Mercenaries 3D is scheduled for release across Europe in July this year. 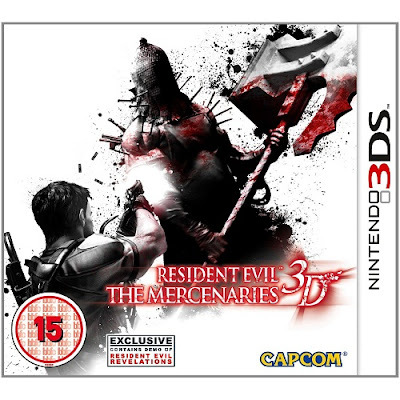 Resident Evil: The Mercenaries 3D will join a growing number of games which have been made available since the launch of Nintendo 3DS earlier this year, which allows 3D gaming without the need for special glasses. For the first time Resident Evil: The Mercenaries 3D delivers the intense Mercenaries gameplay experience on a handheld console. Featuring re-mastered stages from Resident Evil™ 4 and Resident Evil™ 5, the game is a race against time as players attempt to defeat as many enemies as possible before the countdown reaches zero. Resident Evil: The Mercenaries 3D offers players a variety of gameplay formats with a solo mission option or the ability to team up with others across the world in two-player co-op via Internet Play. The game also includes the addition of an all-new Skill Slot feature. Players will be able to fill three skill slots from a selection of 30 skills including improvements to weapon performance, reload speed or melee abilities and customise characters to best suit their style of play. Packed with pulsating action and features, players will be able to control legendary Resident Evil™ characters from past and present in a face off against some of the most terrifying enemies, such as the Executioner and Popo Karimu. Playable characters include Chris Redfield, Krauser, Hunk, Jill Valentine, Rebecca Chambers, Albert Wesker and, making her debut in a Mercenaries game, Claire Redfield. See Resident Evil: The Mercenaries 3D in action at www.nintendo.co.uk/residentevil3d and stay tuned for more updates! This is really good news if you ask me. Nintendo is really making a push with this game to get reconized in Europe and hopefully they can do something similar here in the United States. I'm already excited enough for this game but I'm sure there are a lot of other people that don't even know about it yet. this is a pretty interesting game. i should give it a try.